Great design is at the very center of a great brand. We established in last week’s blog that articulating your WHY gives your brand meaning. But without great design, the meaning remains a concept, rather than an experience. If WHY is the spirit of your brand, design is the body. Design springs from WHY, giving life to your idea and making it tangible. Like a body, it’s not just about looking good. The whole system must be in harmony in order to stay healthy and strong. Design is more than pretty packaging. Good design is baked into the very culture of the company. We are moved by great design. It’s a biological imperative for humans to favor beauty, which is often a combination of structure, proportion and color. Pre-Socratic philosophers were the first on record to bring cosmology, mathematics, science and aesthetics under the same rubric, establishing the concept of beauty as form. Today, we understand that beauty is a basic law of attraction, and we are drawn to people, places and things that are superior in form. Waxing philosophical may not get you very far in the boardroom, but advocating for great design is the responsibility of a great marketer. It’s our job as communicators to articulate the inherent value of great design and demand that design be considered at every stage in the supply chain. This is where most brands go terribly wrong. They consider design a function of Marketing rather than designing the company’s infrastructure and processes around the customer experience. The former sees design as an event; the latter recognizes design as part of the culture that permeates every aspect of the business. Consider the unparalleled customer experience at Thomas Keller’s The French Laundry in Napa Valley, arguably one of the most important restaurants on the American culinary scene. The dining experience is one of the best in the world, and not only for the indescribable pleasure on the palate. The real experience is in the subtle details that you only consider hours later, like the fact that wait staff appear and disappear with the silent grace of a butterfly and the impeccable timing of an orchestra conductor. If it appears like a well-choreographed dance, it’s because Keller hired a veteran ballet choreographer to train the staff how to move with the elegance and poise of a dancer. Is this design? Absolutely. It is a shining example of designing a company culture around the customer experience. Design is more than your logos and labels. Thoughtful, mindful design should be considered the primary language used to communicate ideas, functionality and experience. Design is the first story you tell your customer. Without any verbal cues, design can instantly and powerfully establish the foundation of emotional connection. 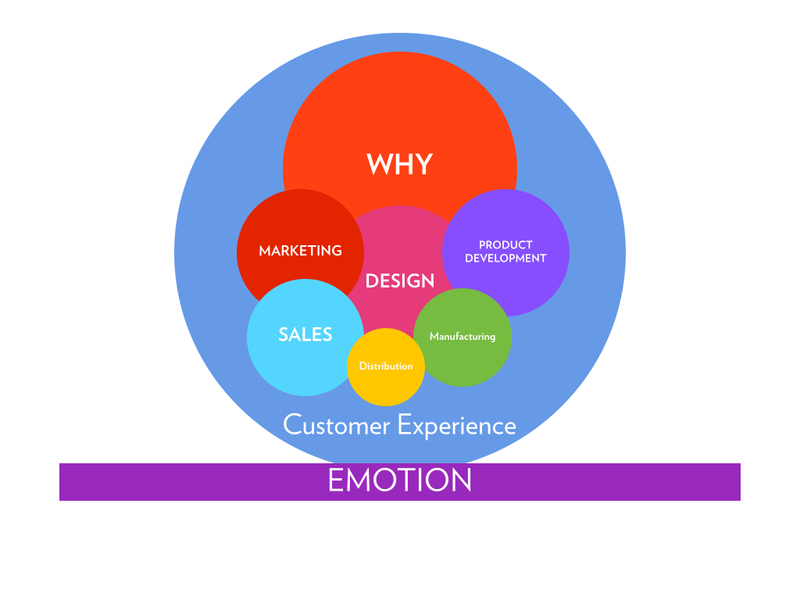 This illustration shows design at the very center of the supply chain, affecting every facet of the business, thus creating the customer experience, which is built on emotional connection. Great design is in the details. The finished product is the tangible representation of your brand’s promise, so it’s wise to spend the majority of your time and energy ensuring the precision and perfection of each detail. This is where the discipline of mindfulness is tested, and where the great brands differentiate themselves from the rest. Is your company designed to deliver the customer experience you promise? Do the materials, ingredients and details align with your values? Does the design fit with your identity? Did you compromise design for cost? Are you focused on the customer experience at every stage in your supply chain? Are you MORE focused on the price and cost structures? Does the design deliver what the customer is asking for in a way that is unique to you? At point of purchase, is the experience designed for ease, simplicity and transparency? Is the design consistent at every customer touch point? Did you test the design, functionality and user-experience before going to market? Are the form, textures, graphics, colors and all other aesthetic details consistent with your WHY? Are you in constant communication with your customers? Great design gives way to unified language, which is the next process in Mindful Marketing. Be sure to read next week, when I cover my favorite topic: Creating Meaningful Content.